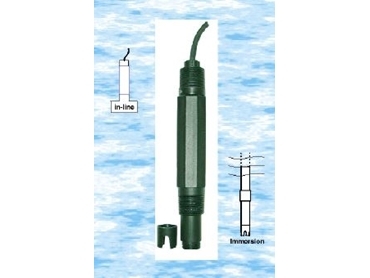 AIC’s universal pH and ORP electrodes. AMALGAMATED Instrument Co (AIC) has announced the release of universal flat surface, self-cleaning pH and ORP electrodes designed for both immersion and inline applications. The flat surface design self-cleans the measuring surface when exposed to turbulent flow thus minimising downtime for maintenance and makes the electrodes suitable for applications where periods between maintenance need to be extended. The non-protruding surface prevents electrode breakage and provides abrasion resistant operation. The electrodes have a double reference junction and a supersaturated KCl reference called Duragel that provide a long and stable life. The combination of the double reference junction with Duragel also enhances the electrodes' contamination resistance. A screw-on protective shroud is supplied to protect the surface in immersion applications. The electrode has 3/4" NPT threads at each end of the body to maximise installation flexibility. The pH electrode has a pH range of 0 to 14pH, a temperature range of 0 to 60°C and can be installed in pressures up to 7 bar (100psi). The ORP electrode has similar specifications to the pH electrode with a measurement range to 1000mV. The wetted materials are glass, polypropylene and platinum (ORP electrode). The polypropylene body gives the electrodes high resistance to chemical corrosion and heat stress breakdown further ensuring usability in a wide range of applications. The electrodes are supplied with a 10 metre cable with a BNC termination. The electrodes team well with AIC's range of pH instrumentation such as the PM4-PH or PM4-OR panel mount monitors, the RM4-PH DIN rail mount monitor and the dual input TP4-PH wall-mount monitor.